Shell Pakistan, the leader in fuel and lubricant products in the industry, needs no introduction. As part of its upcoming promotion to celebrate the launch of V-Power in Pakistan, the multinational has decided to make use of out of home (OOH) media to achieve maximum brand visibility, and to cement its place as one of the country’s premier fuel brands. To this end, Shell wanted nothing less than the best to roll out its brand-new marketing blitzkrieg and pull out all stops when it comes to promoting V-Power in Pakistan. Kinetic Pakistan has produced many out of the box ideas for its clients since many years. Its recent OOH campaign for Shell’s V-Power however, promises to be one of the best it has undertaken so far. The first challenge was to choose the best destination in the country where Shell’s new product could be observed by thousands of commuters at one of Islamabad’s busiest meeting spots. There was no contest when it came to Centaurus Mall and its importance to the city. The Mall was chosen to target consumers, given its status as one of the capital city’s most famous and busiest shopping destination. To promote V-Power, an eye-catching OOH campaign was designed for it – with three giant posters at Centaurus. Given the iconic Mall’s design that consists of three giant towers, for maximum impact, three posters have been installed that puts the ‘power’ in V-Power in a truly majestically spectacular fashion. 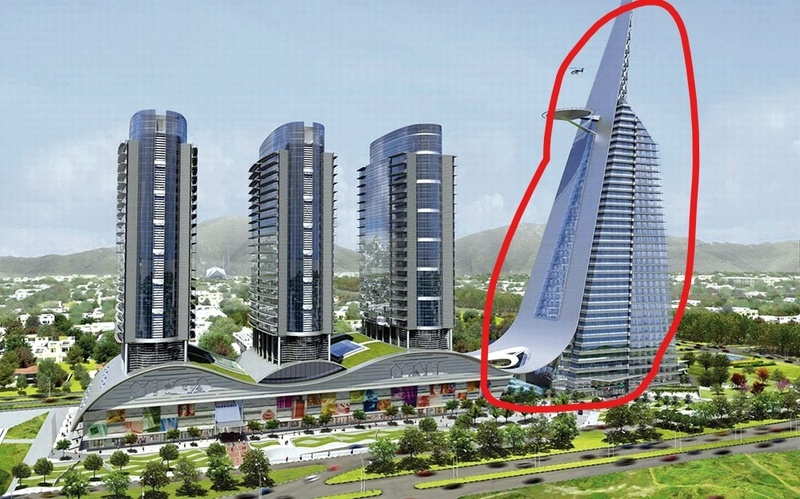 Given the iconic three tower design of the Centaurus Mall, the marketing agency had its work cut out for it. Three giant posters were designed and installed at each of the towers that make up Centaurus Mall. These posters are so big, they can be viewed from a humongous distance of 20 kilometers away! In fact, these posters (which look like giant fuel tanks), cover an area of approximately 55,000 sq. ft! This is the first OOH campaign of its kind at Centaurus and it continues to amaze the people who visit or are passing the mall day in or out. It doesn’t hurt that its visibility extends to 20 km from its original location as well, broadcasting and solidifying the brand’s messaging to more people than ever before. This OOH campaign takes into account Islamabad’s picturesquely natural and orderly landscape, making use of its lean and clean environment to project a client’s promotion far and wide. Its not wonder that the V-Power campaign is already becoming the talk of the town. Two more huge locations were also selected to promote V-Power as part of this OOH campaign. These locations include Ocean Mall (which is one of the highest buildings in Karachi), as well as the A-One building at National Stadium, Karachi. But there’s more. Shell also wanted V-Power to make a huge splash in Pakistan’s cultural capital Lahore. To this end, the campaign rolled out a mind-blowing shimmer billboard, at one of the busiest touch points at Jinnah Flyover, Lahore. Seeing as how millions of people pass through Jinnah Flyover daily, it was decided as one of the best spots to carry out the OOH campaign for Shell. Once installed, this beautiful billboard has proven to be hard to miss. This campaign rolled out with the conventional plan as well across Karachi, Lahore, Islamabad and Rawalpindi to create awareness. For the aforementioned executions, Kinetic Pakistan teamed up with Momentum Media, taking advantage of its expertise. The campaign also deployed some more OOH assets, such as the use of digital streamers at MM Alam Road, Lahore. In Karachi Shell Choosing Ocean Maal & A-One Building Why ? New Ad Telenor is very intrusive plz propk remove it. Yes u r right. I second you. Literally intrusive, it’s appears on every page. For God’s sake, at-least show it once per visitor. yes propk treat like this with their readers which want to support them. i don’t mind ads at all as long as they tend not to be annoying and intrusive. Millions cross the jinnah flyover daily?! Very doubtful that a million commuters would cross the flyover daily. The twin cities have a combined population of 3 million. However, if you add the Metro track right next to it, then we can say that at least 250k commuters pass the Centaurus daily. The last I heard Mövenpick acquired the rights to build it in 2017. It is going to be named Mövenpick Hotel Centaurus and is scheduled for opening in 2018-19.